This earlier build is supposedly dated November 1st, 1983. A photo depicting it was posted on this site years ago. As you can tell right away, the quality is far too high for a photo from the 80s, so I assume it must've been taken in more recent years, perhaps on a modern display as well. However, this also means that the legitimacy of the photo cannot be verified, so take it with a grain of salt. We can see the build tag in the status bar at the top (notice the version number and the date). Based on photos from an issue of a French magazine called L'Ordinateur Individuel where the second build (see below) is also shown, the date in this tag is definitely not the system date. The only other logical option is the date when the build was compiled. There's not that much else going on in this photo. There's A02.PIC opened on the left, notice the drop down menu is not touching the titlebar of the window. On the right, there's Calendar on top, its content text is touching both the top and left window border, and the vertical scrollbar is absent. There's some inconsistencies with the content text alignment between various photos. I can only speculate that's because the text is aligned differently based on window size and position, or, Microsoft repositioned the text several times back and forth before they finally made up their minds. For now, I can't confirm either of these theories. 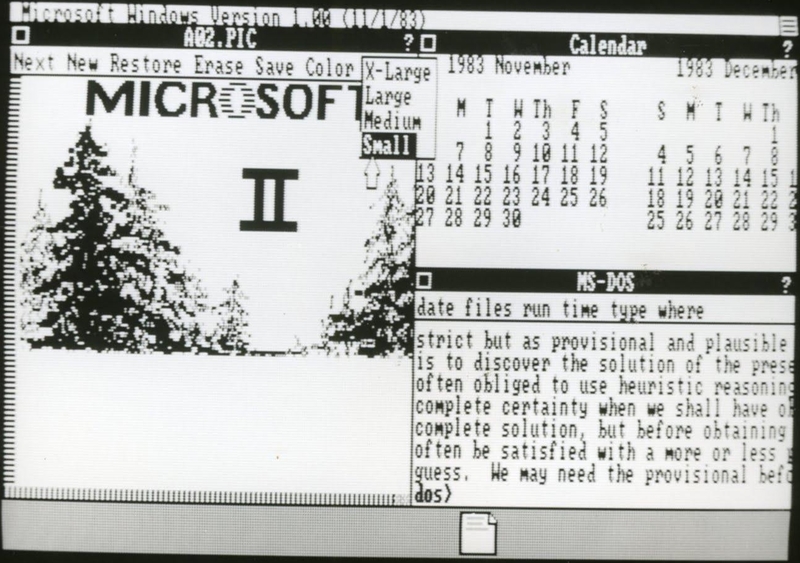 On the bottom right is the MS-DOS window, apparently someone used the type command to display the contents of the sample text file with the usual heuristic reasoning sample text. Menu bar text is touching the bottom border of the menu bar, and the menu is the third (and seemingly final) variant. The dos> prompt is in bold. The only program that's minimized is Text. This photo was found on this other website, where it's said it came from an issue of Monthly ASCII, a Japanese computing magazine. Sadly the scan/photo is of poor quality, but at least it's something. This build is apparently dated November 20th, 1983. As mentioned above, the same build was extensively photographed by L'Ordinateur Individuel. I'll discuss those photos in the next part. On the left we have, from top to bottom, MS-DOS window, Art, Clock, and Text. MS-DOS window looks the same as in the November 1st build. The other thing worth pointing out is that this build has window controls on the far left of the titlebar. On the right, there's an app called Spread Sheet, which I've mentioned briefly in the previous part. It looks like a Windows counterpart of Multiplan for DOS, though its usability/completeness at this time in development is questionable. Below that is the Calendar, and here, text is clearly not touching the top border and perhaps not even the left one. Further down there's A01.PIC and A02.PIC, the latter looking rather different from the usual demo pictures. No apps are running minimized. It's hard to tell just based on photos how this build tag is even displayed. When is it displayed, for how long, is it only on startup, can it be reactivated by the user once it disappars (clearly it disappears eventually), etc. Unless some new evidence is found, it's hard to conclude anything. I've been searching for an alternative source of the first photo, as well as scans or photos of the specific issue of Monthly ASCII, and had no success with either for now. But at least the photos tell us that by November, the UI was already very similar to the one in the COMDEX build(s), meaning the latter is likely from November too, whereas builds with earlier UI are definitely not. Next part will go over the second build in more detail, thanks to the photos from L'Ordinateur Individuel.